Molly was my first crush ever way back in kindergarten. Why would I bring this up, well that’s easy because our first ‘date’ was a field trip to Aullwood Audubon Center and Farm. Although Molly and I am no longer an item, what I do recall is a great experience we had at this wonderful place as we learned, explored and marveled at the wonders of nature and had fun at the same time. On a side note, a picture I drew of animals on the Aullwood Farm from that very same field trip was unearthed recently in my attic. It’s now a little yellowed, but hangs proudly in the nature center. Make sure you check it out on your next visit and yes, that’s not a dog, it’s a cow. Come on, I was five! OK, back on track now and a little background on Aullwood. Over 50 years ago Marie Aull gave her land to the Miami Valley, creating the National Audubon Society&apos;s first nature center in the Midwest. Today as visitors explore the Marie S. Aull Education Center, walk the trails and experience Aullwood&apos;s organic farm, they discover why Aull&apos;s gift is the very best among nature centers. Over 100,000 visitors from tots, school children, teens, and adults -- are engaged in exciting on-site or outreach programs every year. By nourishing familiarity with nature and sustainable agriculture, Aullwood encourages environmental activism to ‘kids’ of all ages. You could say, they were green before green was cool. 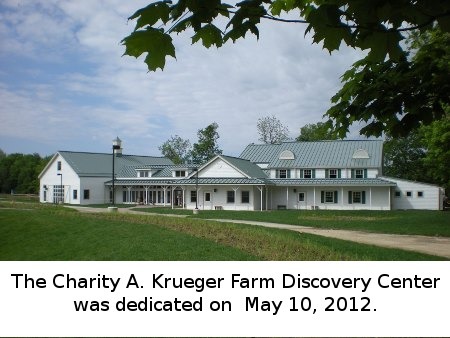 Today the mission continues, but with a top notch education center and the brand new Charity A. Krueger Farm Discovery Center, Aullwood has new tools to inform and enlighten on the importance of nature in our every changing environment. And don’t forget the farm and nature center are open year round. Plus, did I mention it’s still a great place for a date? For more information, visitor’s hours, programs, events, plus all their awesome organic foods and just all things Aullwood, visit aullwood.center.audubon.org or call (937) 890-7360. Please note: The Dayton CVB has compensated me to share my thoughts on the Aullwood Audubon Center.